Discussion in 'Wood / Woodwork / Carpentry' started by thatbloke, 10 Jan 2011.
can anyone recommend one for this type of job? quite tight curves. I am cutting brackets out of green oak to support a joist support beam on an old timber framed building, the original oak pegs have let go. A quick look at screw fix has brought these up. its says nothing about cutting curves in any of the descriptions, it also needs to be a fine cut as well. You need a bandsaw, not a jigsaw. Jiggy will struggle with that, you could give it a go but will probably end up finishing up by hand with a spokeshave or similar. I'd suggest farming these out to a local joinery workshop with the right machinery. 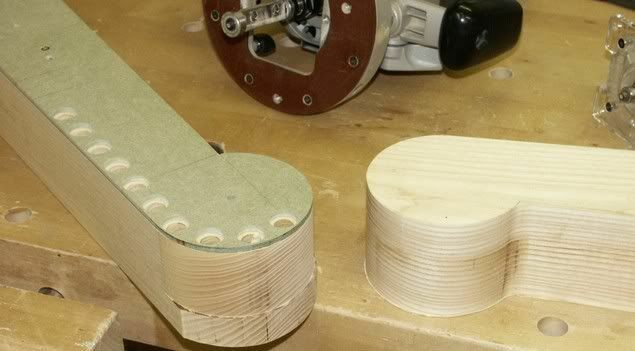 Alternatively, make a softwood template (has to be accurate) and template cutter in a full sized router. Dont mind finishing it by hand, thats not a problem. Its not a terribly complicated pattern , just a single curve. I dont mind if its a bit rough as the rest of the timbers are a good 500 years old and all dont with a pit saw and adze so it doesnt have to be pretty. I've used these on green and seasoned thick oak; http://www.axminster.co.uk/bosch-bo...ing-jigsaw-blades-prod23437/?searchfor=t344dp but you will need a powerfull saw and one with blade guides to cut accurately, I use the Bosch gst135. As said the bandsaw would be your best bet, however, as you are putting this into an old timber framed building then perhaps a touch of roughness wouldn't go amiss. Power tool wise I will often use a chainsaw for this type of cut to rough it out and finish with an axe, adze or plane. One trick we use for this type of thing is to have a spare blade for a handplane ground with a curve to the cutting edge. Then using it in the plane clean up the work by planing at something like 35-45*. It's impossible to get a smooth finish but you do end up with a decent "tooled" finish to the timber that can look very convincing. Incidently if all the other oak is old and your brackets are new and you want to age them a little try painting with a little lime water. Fresh unslaked lime is even better , mind your eyes and skin and paint on the water whilist still hot. Oh try it on a piece of scrap first to guage colour. As said a bandsaw would be the easiest but you could rough cut and then finish with a router and template, just clean up teh router bit afterwards to save it rusting. yes you can do it with a template guided router cutter plunging 6mm each pass (up to 50mm depth) , then cut off the remainder with a hand saw or jigsaw from the other side. finally use a flush trim cutter from the rough side. you must be careful of the grain direction though. up to 50mm depth you might still come from a particular side for each section to avoid catching the grain and ripping it off the workpiece. that's why you can get routers and cutters that will reverse but they are not common. it's a little bit hard to describe you must experiment first with scrap. otherwise a band saw but i would need to be a strong one. jigsaw - no chance. Does tanalised/kiln dried joist/carcassing timber need to a climate? What drill bit do I need for making big holes? Does laminate flooring need time to acclimatise? Making a wall wardrobe in extension - need advice. Need advice buying a jigsaw.